This year, Killarney’s Holiday Village are giving €50 off every booking for Killarney Mountain Festival. Book today by contacting us on info@killarneysholidayvillage.com or give Breda a call on 089704342. Quote Killarney Mountain Festival when booking. 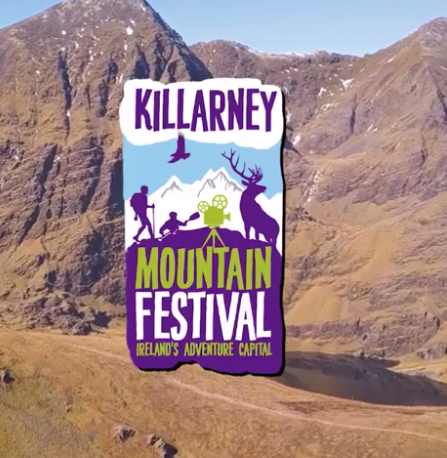 Following on from the roaring success of Killarney Mountain Festival 2018, come and join the even bigger & better 2019 event! Just some of the cool activities on offer will include a Kiddies junior Quest Adventure race, Cultural and historical walks and talks, Outdoor & Adventure film screenings, Inspiring guest speakers, Guided walks and hikes, Park run, Photography and Art exhibits, Family fun activities to suit all ages and energy levels including a family treasure hunt, a fantastic display by the amazing Mountain Rescue Search Dogs, Demos, Trade-stands, Delicious food vendors, Musical entertainment, Q&A sessions and much much MORE! There is a fun-filled timetable of scheduled events and keep an eye on the festival blackboards for exciting pop-up events taking place each day at Basecamp…Friday and Saturday night will host live bands and it is a great place to mix and mingle with all the festival goers.